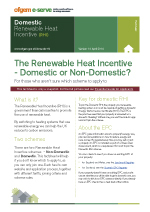 The Government has now launched both phases of the Renewable Heat Incentive (RHI) for renewable heat technologies and it is split into two categories; Non-Domestic and Domestic RHI scheme. The Renewable Heat Incentive (RHI), the first scheme of its kind anywhere in the world, is aimed at encouraging the installation of renewable heating equipment such as solar thermal panels, biomass boilers and heat pumps. It is designed to pay property owners for each unit of renewable heat produced over a period of 7 or 20 years, depending on which scheme you are eligible for. In July 2011, the commercial phase of the RHI was launched for installations in the industrial, business and public sectors. Tariffs for non-domestic installations are listed here. 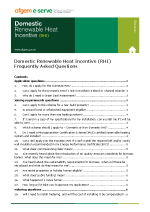 Biomass, some types of ground-source and air-source heat Pumps, solar thermal and biomethane projects in the non-domestic sector are eligible for RHI payments, which are made quarterly over a 20-year period to the owner of the renewable heating system. Ever installation is metered and payments are made only for heat requirements that are eligible for the RHI. A non-domestic installation is defined as a renewable heating unit in a building that is not used as a domestic premise. This includes office buildings and schools. In addition to this district heating schemes (e.g. one boiler serving multiple properties / buildings) fall under this scheme. The level of support that an installation receives is fixed, but will be adjusted annually with inflation. Go to the OFGEM website for more information on RHI tariffs for Non-Domestic installations. The RHI for domestic properties finally opened in Spring 2014, however if you already have a MCS certificated renewable heating system installed after 15th July 2009 you may still be eligible for RHI payments. Please follow this link to OFGEM for further information. For biomass, boiler sizes are limited to 45kW or smaller, but you can install multiple boilers as long as they are on the approved MCS lists. Any boiler larger than 45kW is not eligible under the Domestic RHI Scheme. Air source heat pumps must have a minimum SPF of 2.5 or above to qualify for the scheme. 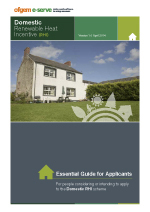 Please download the guide below for a full list of rules and eligibility for the scheme.